Page revised in November 2017. Photos taken in 2015 with Canon Powershot SX 700 HS. You may wish to read a page on the town first. 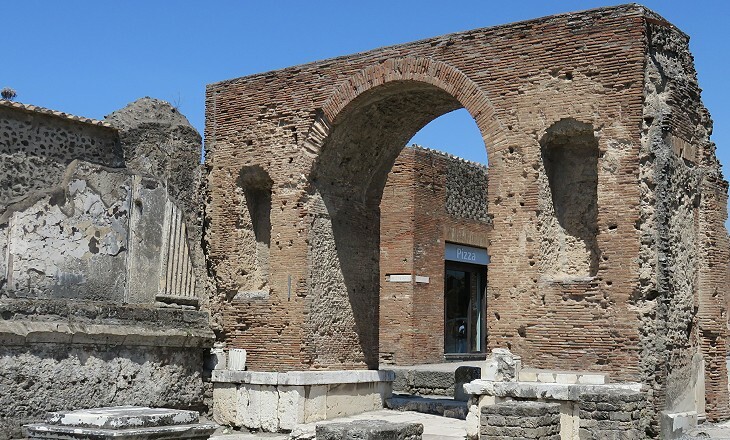 A Roman basilica was a large public building where business and legal matters were discussed. 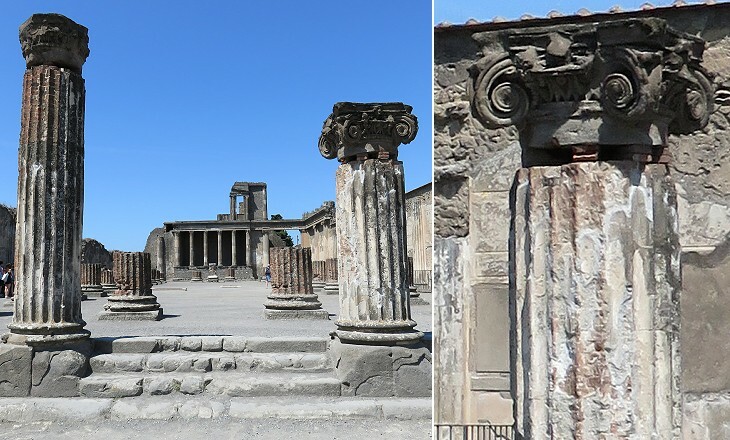 The basilica of Pompeii was built in 130-120 BC and is one of the oldest examples of such a building. It had three naves and it was situated at the south-western corner of the Forum; its entrance was on its eastern narrow side and its layout resembles that of an early church. A raised loggia at the western end of the building was most likely the site of the tribunal. Archaeologists believe it was preceded by wooden stairs. Two small rooms under the loggia might have been used as the temporary prison. Lawyers without customers, teachers without pupils, artists without commissions and other jobless citizens spent their days at the basilica hoping to find a way to make some money. Some of them, perhaps during a particularly idle day, wrote graffiti on the walls complaining they were not invited to dinner by anyone or that Venus did not help them in courting a woman, notwithstanding the offers they had made at the nearby temple to the goddess. 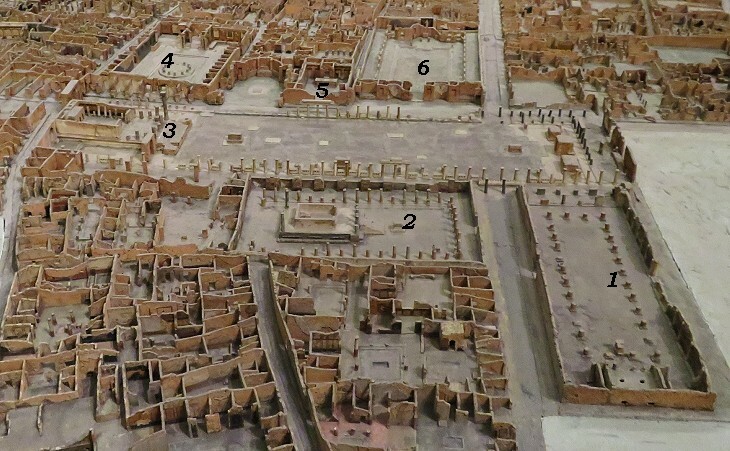 The Forum of Pompeii had a rectangular shape with at its southern end the basilica and other buildings having a municipal purpose (a "tabularium" with the official collection of laws, a hall where ballots took place, another one which served as the town hall). At the northern end of the Forum, the Capitolium and two honorific arches symbolized the link with Rome. The Forum was designed in the IInd century BC. Its columns were built using local dark volcanic stone, but in the Ist century AD, many of them were replaced by white limestone columns. 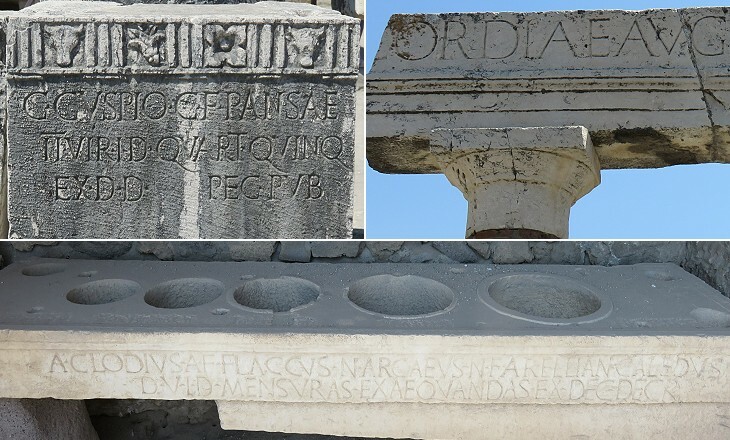 The capitals of the lower row were designed according to the Doric order and those of the upper row according to the Ionian one. The orders did not define only the shape of the capitals, but the relation between width and height of the shafts too. Evidence of at least four honorific arches has been found in the Forum. Of these the best preserved one is situated at its northern one. The two niches housed statue of emperors or members of the imperial family and archaeologists assume that a third (equestrian) statue was placed at the top of the arch which was taller than it is today and bore an inscription. This statue might have fallen during the earthquake of 62 AD and not been replaced. In 88 BC Rome quelled a revolt of Italian towns by two means: on the battlefield and by granting Roman citizenship to all freemen living on the peninsula. 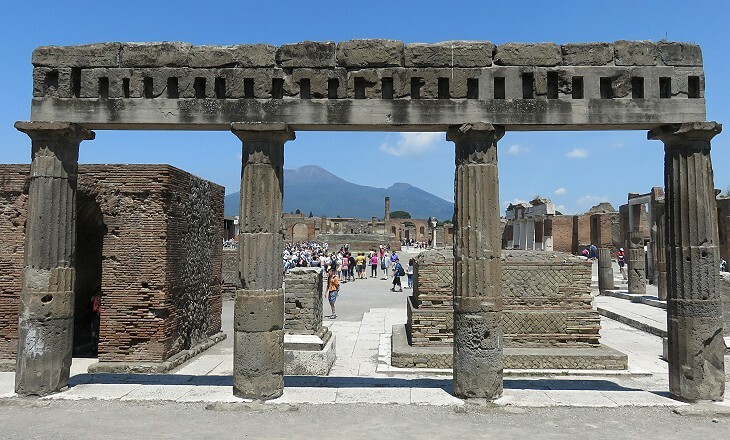 Italian towns enjoyed different degrees of self-government according to whether they had always been allies of Rome or had rebelled (as Pompeii did). The Romans did not appoint governors, but in some cases they denied access to positions in the municipal administration to citizens who were not of Roman origin. 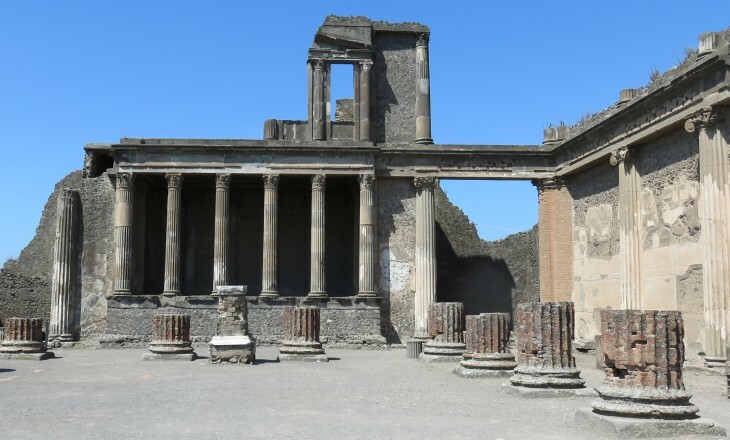 By analysing the many inscriptions which celebrated big and small improvements in the Forum, archaeologists have been able to identify the most influential families of Pompeii and whether they were of Roman or local origin. The political structure of the town was based on 100 decurions who were responsible for ensuring compliance with Roman laws and for tax collection. Two of them (Duumviri) were elected for one year (similar to Roman consuls) for the running management of the town; they were assisted by two aediles in charge of the maintenance of public buildings, streets, fountains, etc. They could rely on a small permanent staff. 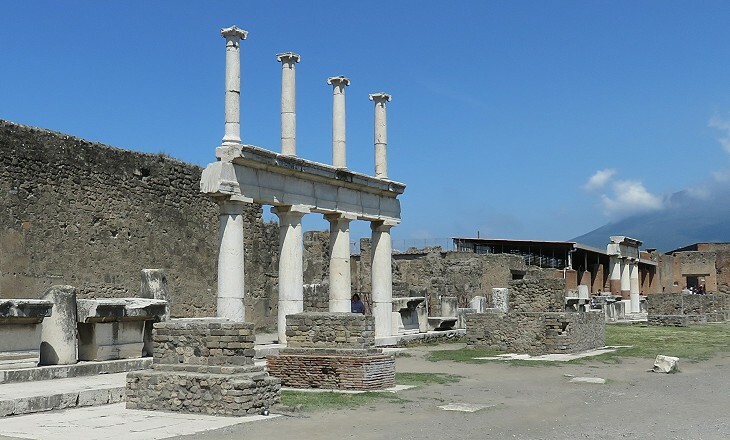 A citizen of Pompeii, after having spent the morning at the Basilica and in the Forum to chat with friends and to learn what was going on, most likely spent the afternoon at one of the bath establishments of the town. Terme Stabiane is not an imposing building, it has rather the size of the baths described by Seneca in one of his letters. New larger baths (Terme Centrali) were in the process of being completed when the ashes of the 79 eruption covered the town. 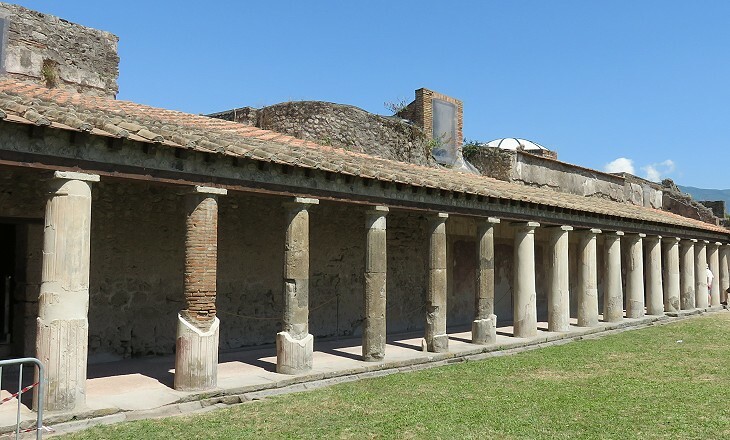 Terme Stabiane was the oldest bath establishment, but it was almost entirely refurbished after the 62 earthquake. It was excavated in 1854-59 and thanks to Giuseppe Fiorelli, a young archaeologist, it was not deprived of its elaborate stuccoes. It was an unusual decision at that time, because the prevailing opinion among archaeologists was that only the walls of a museum could effectively preserve a valuable work of art. 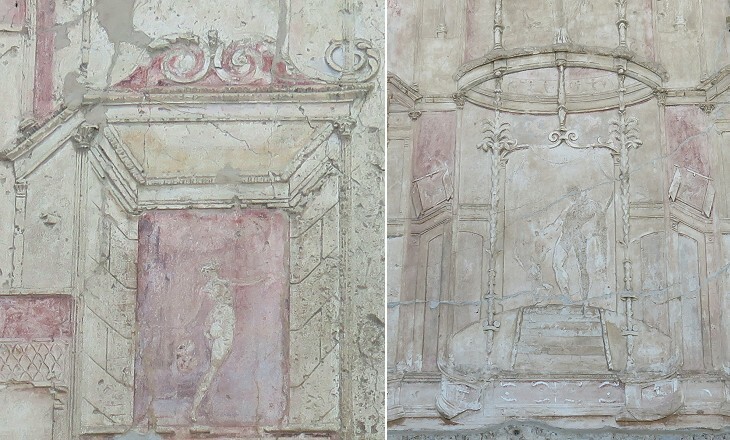 Art historians have classified paintings found at Pompeii into four styles. The last one covers the paintings between the 62 earthquake and the 79 eruption which are characterized by the depiction of complex buildings. This "fourth style" applies to the stuccoes of Terme Stabiane which recall Renaissance and Baroque illusory paintings. Terme Stabiane was reopened to the public in 2012, after a restoration which required several years. Vitruvius recommended the facing of bath halls with stucco because of its resistance to changes of temperature and humidity (De Architectura, a treatise on architecture). 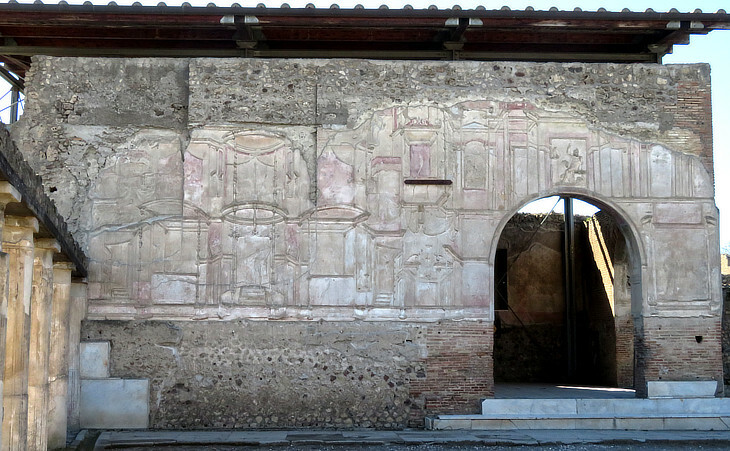 Terme Stabiane has some of the finest examples of Roman stuccoes. 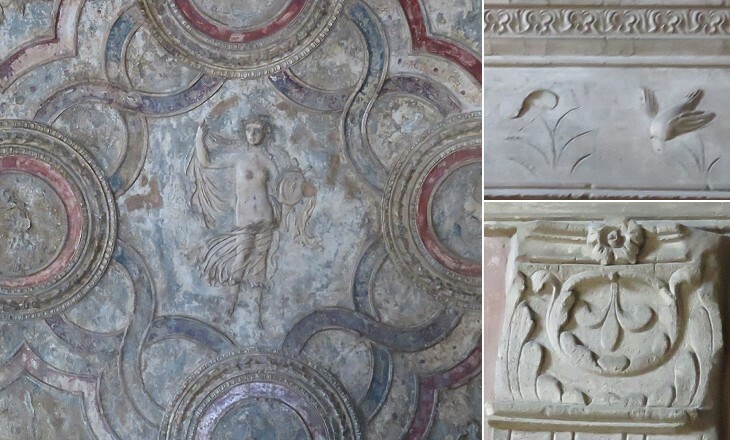 The image used as background for this page shows another stucco panel portraying Jupiter.